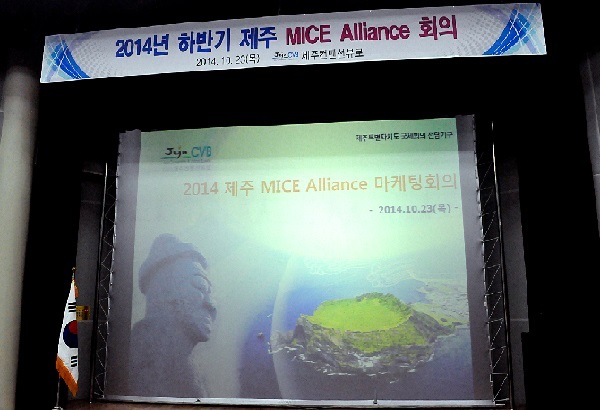 Jeju Convention & Visitors Bureau its second Jeju MICE Alliance Meeting of the year for 2014 on Oct. 23 at Jeju Welcome Center. MICE Alliance members from hotels, airlines, tour companies and conference organizers participated. All attendees were concerned with developing the local MICE industry and JCVB gave a presentation on current business conditions and future plans for 2015. Tourism management professors from Jeju National University also contributed to the discussion. JCVB introduced their online and offline efforts and promotion activities coorperation was requested for MICE transportation card and suggestions encouraged for MICE plans in 2015. Regarding the direction of the Jeju MICE industry, the advantages of Jeju were stressed, particularly regarding the island’s strong performance in incentive tourism in recent years. To continue this growth, increased tour visit and continuous improvement of facilities was prioritized.